News from the print room. Our print partner wins big in Cape Town. We have used Southampton-based printers Hobbs since 2008 for all our book projects and other print requirements. It’s always a good feeling to know that people you like and admire are making their mark so we’re jolly happy to announce that our print partner was recognised with two Awards at the International Print Network’s Conference held in Cape Town, South Africa. 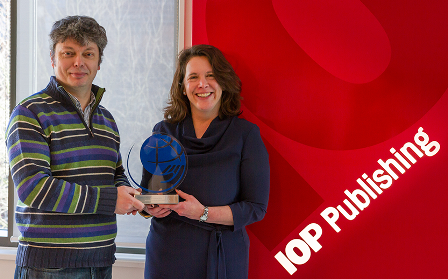 The first Award of the two was given for Hobbs’ development of a fully automated Article Reprint solution built for the Institute of Physics Publishing in Bristol. The Award recognised the complexity and intelligence of the solution that allows an academic audience access to over 600,000 articles and the ability to purchase multiple copies of those of interest. The second was the Outstanding Recognition Award presented to Graham Bromley, Hobbs’ Deputy Managing Operations Director, saluting his contribution to the IPN through management of the IPN Technical conferences and work of the IPN Board. Graham is one of 13 people who make up the Board of the IPN. Members are drawn from partners in the UK, Netherlands, USA, France, Canada and Singapore – a truly international group. Want to know more about the high calibre work of Hobbs the Printers Ltd? Click here. Graffiti marks launch of East Dorset’s NEW publishing consultancy. Us! Dying for your art? Charles Dickens’ indefatigable writer Walter Thornbury. #wonderword! Dégringolade, Captain Haddock and Theresa May. What do olives and Charles Dickens have in common? The #wonderword oleaginous. J.K. Rowling and Norman Mailer. How authors of blockbusters plan their plots. So old it’s new. How Letterpress is making a comeback. David Ogilvy’s 10 hints on how to write for clarity and precision. Lala on David Ogilvy’s 10 hints on how to write for clarity and precision. how to make a relationship better on David Ogilvy’s 10 hints on how to write for clarity and precision. Copyright Burnt Toast Editorial 2017-2020. Images, written content, excerpts, links and video clips may be used provided that full and clear credit is given to Burnt Toast Editorial with appropriate and specific direction to the original content. Third party content published on our site must be authorised by its originator via Burnt Toast Editorial. Website powered by Clean and Fast Web Services.